I think I am officially an adult. 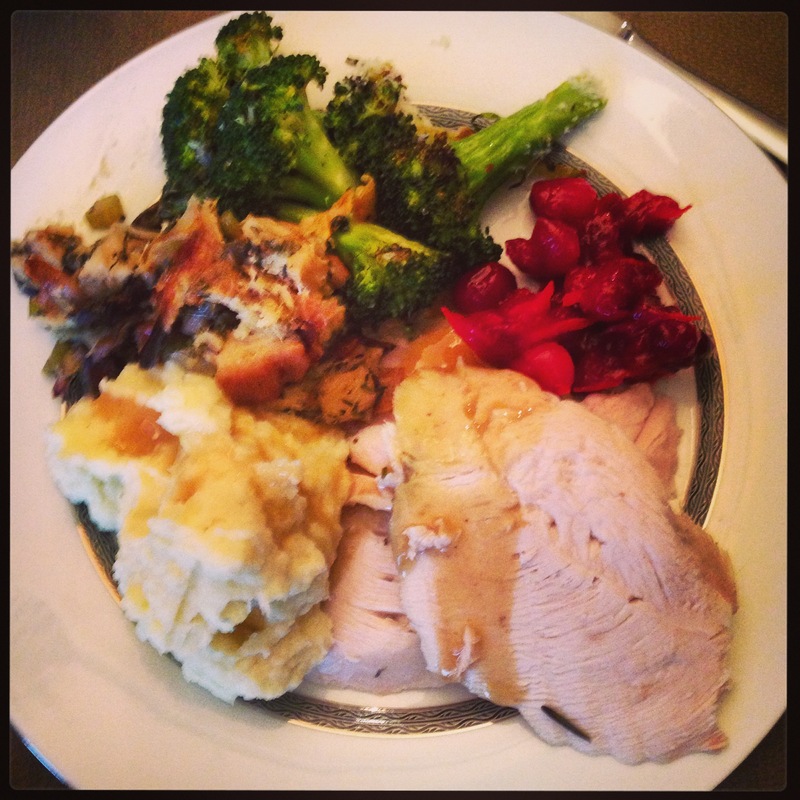 Last week Matt and I hosted Thanksgiving and we lived to tell about it. This feels momentous. We had all the fixings: turkey, dressing, mashed potatoes, gravy, cranberry sauce, and the requisite green vegetables to cancel out the mass quantities of cream, butter, and carbohydrates we consumed. I am going to share the dressing recipe with you because frankly, I think it’s perfect. But first, let me share with you some stories of Thanksgivings past, because rumor has it that this holiday really isn’t supposed to be about the food after all. For many years, my eccentric family of amateur musicians had a very strange tradition of singing a random collection of classic show tunes and Beatles songs, arranged in four part harmonies. Ruth or Elaine played piano, dad and Lee were our tenors, I made an attempt at the soprano line, but my poor sight-reading skills always failed me. My favorite song in our repertoire was “Twas the Night Before Christmas,” a very strange choice for a Jewish family that included both a cantor and a former Hebrew School teacher. I loved it because there were funny little speaking parts, a flurry of twinkling keys, and deep Santa laughter that our collection of tenors and baritones struggled to replicate. My dad had his own special contribution to the song, which he built up to with great and evident enthusiasm. When we got to the line: “threw open the sash,” he belted out over everyone else, “threw up on the sash,” before snickering at his own joke. This invariably sent me into hysterics, too. I remember the first Thanksgiving after he died. I was sad and angry that all of us were there and he wasn’t, but also thankful that we had each other and lemon meringue pie (I told you we were weird). That was also the last Thanksgiving I spent with the family at Aunt Jane’s. After that I spent a few years with Matt’s family, then my mom hosted a few mini-family Thanksgivings in Maine, while the Adler family splintered apart and went their own ways. This year, the time seemed ripe to start a new tradition, a Matt and Sarah Krauss tradition. My in-laws, brother-in-law and his girlfriend, and my mother joined us for a small, cozy meal. We watched football, we played Scrabble, we ate until we hurt and had to retreat to the couches. It was exactly what I wanted and I can’t wait to do it again next year. Cut the challah into 1″ cubes. Leave the cubes out on a parchment lined sheet pan on the counter to get stale, at least overnight, and preferably 2 days. Melt 3 oz. of butter in a large heavy saute pan. Saute the onions until wilted, add the herbs, celery and mushrooms and cook until just slightly cooked through. In a large bowl, combine bread cubes, vegetables, melted butter and vegetable stock, and salt and pepper. Test for seasoning and adjust. Press stuffing into a large buttered baking dish. Cover with buttered parchment, and then foil. At this point, the stuffing can be held for several hours, but should be at room temperature before baking. Bake at 350 for 45-55 minutes, the last 10-15 minutes without the foil and parchment, to crisp the surface. Tags: baked goods, bread, fall, holidays, side dishes, traditions | Permalink.